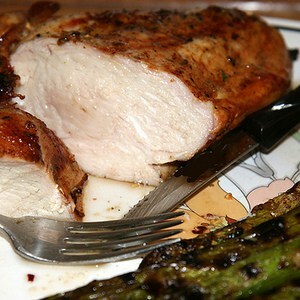 Sous vide chicken is one of the simplest applications of sous vide that there is. Often times chicken gets very dried out when cooked using traditional methods. Also, many chicken breasts are not of even thickness, which can make it very hard to ensure the whole breast is not under or over cooked. When cooked over high heat the outside of the chicken can also get very stiff and dry before the middle has a chance to cook all the way through. At it's simplest, sous vide chicken just entails sealing a chicken breast with salt and pepper and cooking it at 140F for 1½ or 2 hours. You can then use the pre-cooked chicken in any number of applications, or eat it as is. Pre-heat the water bath to 141F. Lightly salt and pepper the chicken breast and place in a pouch. Add the thyme and rosemary to the sous vide pouch and then seal them. Place the chicken breasts in the water bath and cook for around 1½ or 2 hours.